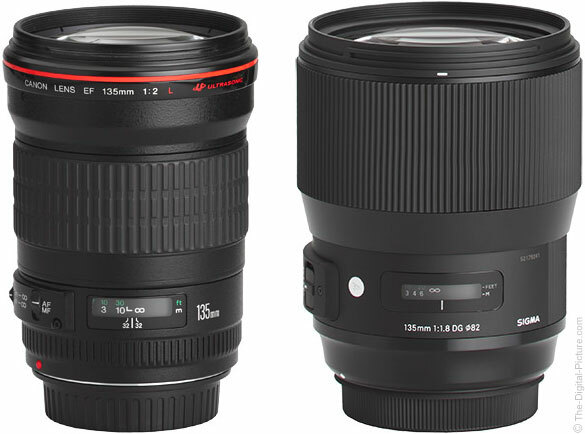 > Should I Get the Canon EF 135mm f/2L USM or the Sigma 135mm f/1.8 Art Lens? The Canon EF 135mm f/2L USM lens has been a staple in the manufacturer's lineup for more than 20 years. With the announcement of Sigma 135mm f/1.8 DG HSM Art lens in early 2017, consumers finally had a comparably spec'd alternative to Canon's popular 135mm wide-aperture prime. If you have been considering the addition of a wide-aperture telephoto prime lens to your Canon-based kit, you may be torn between the two options. To help the decision making process along, we're going to see how these two designed-for-portraiture lenses stack up against one another to see which one might be the better choice for your needs. Who should opt for the Canon EF 135mm f/2L USM? The EF 135mm f/2 USM has been a favorite among portrait photographers since its introduction. Its telephoto focal length combined with an f/2 max aperture makes backgrounds melt away giving more emphasis to your subject. In those ways, it's almost identical to the Sigma offering. However, from an AF perspective, Canon DSLRs tend to work optimally with Canon-designed lenses. While the Sigma 135 Art proved adequate (but not stellar) at consistently nailing focus in our tests, those shooting once-in-a-lifetime moments (weddings, editorial/documentary, etc.) will likely prefer the Canon option. For those wanting to extend the lens's reach, the 135L is compatible with Canon's 1.4x and 2x Extenders with full AF being retained regardless of the body being used. The Sigma is not compatible with teleconverters. If reduced size and weight are high priorities, the Canon's dimensions and weight will make it the preferred choice. Also, those with a limited budget will appreciate the Canon's significantly lower price tag. Who should opt for the Sigma 135mm f/1.8 DG HSM Art? With a 1/3-stop wider max aperture, a design that's 20 years newer and better wide-open image quality, there's very little not to like about Sigma's longest focal length Art lens (to date). As I mentioned above, AF consistency is not quite as good as the Canon alternative, but it will likely be sufficient for most photographers' needs. Those shooting with a DSLR that does not feature Autofocus Microadjustment (like the Rebel-series and 77D) will certainly enjoy the Sigma 135 Art's ability to calibrate focus parameters via the Sigma USB dock, as they would need to send both their camera and lens to a Canon Service Center in order to similarly adjust a miscalibrated Canon lens. While these lenses are more similar than they are different, the differences will be enough to tip the scales in one direction or the other based on a photographer's preferences, priorities and budget. Although a bit long in the tooth, the Canon 135 f/2L USM is still highly regarded by portrait specialists (and for good reason). However, the Sigma 135mm Art raised the bar in regards to wide-open image quality, and those wanting to add the latest and greatest to their kits will certainly benefit from Sigma's commitment to one-upping the competition with its Art-series releases.